Whether you observe Christmas, Hanukkah, or simply enjoy the seasonal spirit, holiday traditions are apparent around every corner in the greater Pittsburgh area. But there are some places and exhibits that stand out and delight people year after year. Enjoy the 2018 holiday season in Pittsburgh at one of these beautifully decorated spots. Celebrate Christmas around the world between mid-November and mid-January at the University of Pittsburgh as the Nationality Classrooms in the Cathedral of Learning are decorated in the traditional holiday styles of the countries they represent. The 26 rooms depict Pittsburgh's diverse ethnic heritage with examples from Eastern and Western Europe, Scandinavia, the Middle East, Asia, and Africa. A Pittsburgh tradition that has enchanted visitors for almost 100 years, the Miniature Railroad & Village features handmade scale replicas of historic sites from around Western Pennsylvania. It's free with a paid admission to the Carnegie Science Center. Each holiday season, five fancifully decorated 20-foot holiday trees grace the Grand Hall of Architecture at the Carnegie Museum of Art in Oakland. Opening day in 2018 is November 28. Nearby, in the Hall of Sculpture, the ​Neopolitan "Presepio" is an elaborate re-creation of the nativity scene, one of the finest and most complete examples of its kind. PPG Place, a business complex located in downtown Pittsburgh, looks ready for the holidays all year long; it resembles a perfect ice castle with a glittering glass exterior that Elsa would be proud of. It opens for the 2018-19 winter season on November 16, Light Up Night in downtown Pittsburgh. 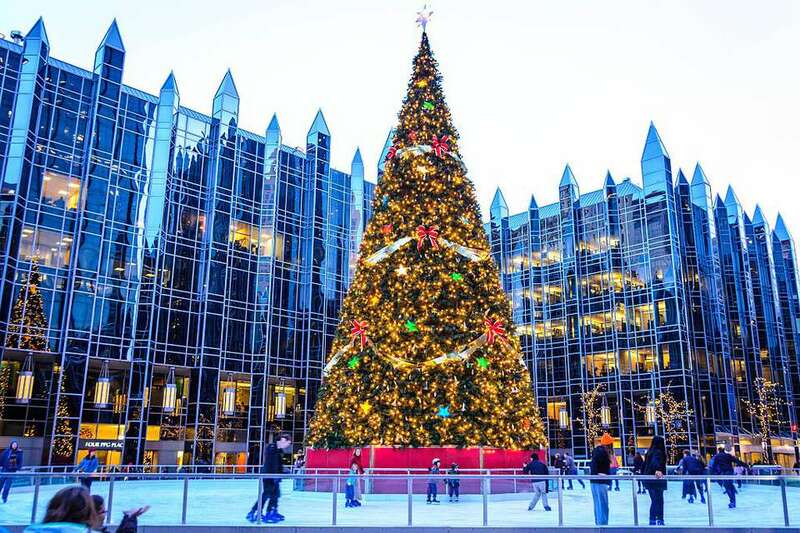 Take your celebrating on foot by skating around the breathtaking 65-foot lighted tree in the center of the beautiful outdoor Rink at PPG Place. Then warm up in the PPG Wintergarden as you enjoy the annual ​Spirits of Giving From Around the World exhibit. The colors of the holiday season explode at Phipps Conservatory each winter, as colorful poinsettias, delicate winter flowers, and fragrant evergreen trees entice visitors to the annual Winter Flower Show, complete with a Winter Light Garden, candlelight, and live music. The garden is open extended hours from November 24 through January 7. Plus, Santa Claus makes an appearance each weekend and the full week before Christmas for visits and photos. Enjoy Christmas the way it used to be at the Harmony Museum in Butler County. The main museum building, Wagner House annex, the Ziegler log house, and other homes in this restored old German village, former home of the Harmonists, are beautifully decorated for the holidays. The museum also hosts a traditional German Christmas Market in mid-November. Every room in the lovely 16th-century mansion at Hartwood Acres is decorated for the holiday season. The annual Hartwood holiday tours run from mid-November through early January, and candlelight tours are offered and are especially fitting for the season. Pittsburgh goes all out for the holidays with its Light Up Night, which takes place on November 16, 2018. There are several tree-lightings, along with fireworks to top off this holiday opener. As part of that celebration, the Pittsburgh Creche opens. The Pittsburgh Creche, a larger-than-life nativity scene, is the world’s only authorized replica of the Vatican’s Christmas creche on display in St. Peter’s Square in Rome. Experience German Christmas customs and traditions of the early 19th century at Old Economy Village in Ambridge, Pennsylvania. You'll see the entire village decked out in its holiday finest, plus music, crafts, traditional German food cooked by a local church, and family events. The holiday​ Weihnachtsmarkt sells unique handmade gifts made by local craftsmen.